We have been keeping you updated with every single & small detail from iPhone jailbreak community. 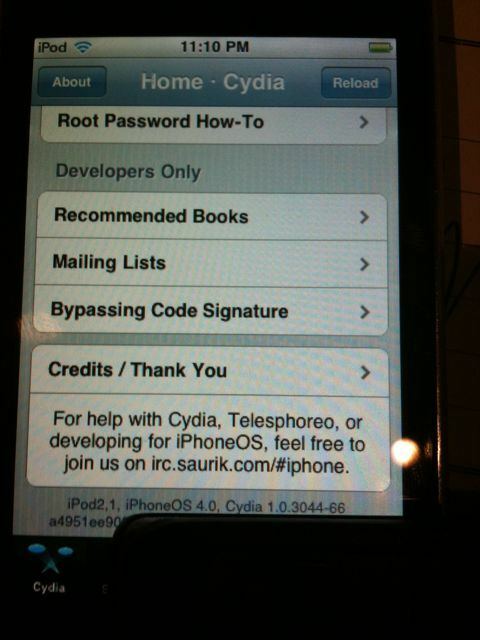 Yesterday we presented step by step guide to jailbreak iOS 4.0 on iPhone 3GS where as Redsn0w 0.9.5 Beta 4 can be used to jailbreak iOS 4.0 on iPhone 3G. Now iPod Touch is only left out iDevice which is yet to be jailbroken. The more details will be coming soon. Subscribe to RSS Feeds or follow us on Twitter to stay tuned with iOS 4.0 jailbreaking & unlocking news. redsn0w 0.9.5b5? My touch 2g’s jailbroken [OS4 GM]. WE nEED the 3g jailbreak!!! @ejaz, you need your shsh blobs. Don’t downgrade though; there’s no point and you will get used to 4.0.
have anyone try to jailbreak touch 2G with the snowbreeze 1.7? does it works? its so amazing and unfortunate to the iphone n ipod touch users ..i m sorry to say but apple prouducts such as iphone n ipod r not user friendly at all..each time we download or sync music from one prouduct to another either my iphone or ipod gets jail locked …and its really expensive for us to unbreak it ..do something or give us some specific solution that can b carried out at home without having to pay money.